A dash cam caught the driver of a Maserati let loose his rage at the driver of a lorry last Friday, September 7, at Lorong Chuan Road. 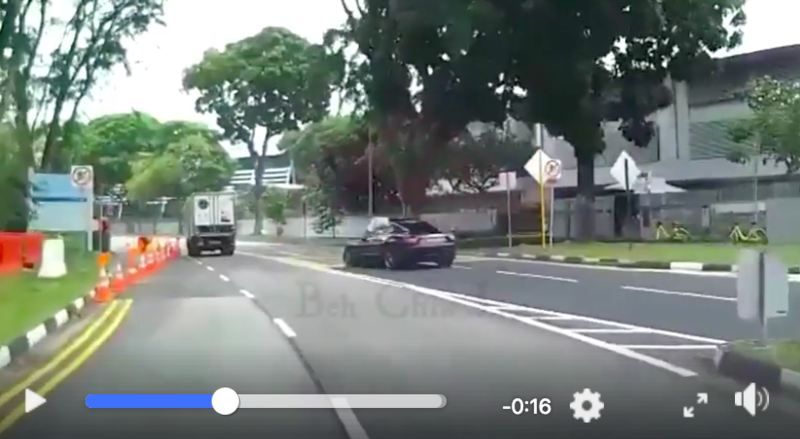 The footage was uploaded today on the Beh Chia Lor—Singapore Road Facebook page on Tuesday, September 11, and has been viewed almost 270,000 times and shared almost 4000 times. The Maserati driver SKK9192G road rage lorry driver.This happened along Lorong Chuan at 1:10pm on 7/9/2018. The video begins with the Maserati driving very quick and seemingly trying to overtake the van from the right side, and is unable to. The driver of the sports car therefore ends up going over a curb and winds up on the wrong side of the road. The driver then speeds over to theopther side to catch up with the van and then cuts into the van’s lane, forcing the driver to come to a stop, ostensibly to pick a fight. The video, however, stops short of showing the altercation between the two drivers. The video shows that the van had been straddling two lanes, presumably to avoid some traffic cones on the road, which is why the driver of the Maserati was unable to overtake the van. Had there been no center island, the Maserati would have surely been able to do what its driver wanted, but since there was, he or she bumped it and was forced to swerve all the way to the wrong side of the road. Thankfully enough, traffic was light and the Maserati did not crash into another car. Commenters on the Facebook post have been quick to call out the driver of the Maserati for his speedy and reckless driving, especially since the incident had happened near a school zone. One commenter actually recognized the Maserati and said that the driver is a regular speeder. She appealed that the driver of the sports car be investigated. One netizen, however, felt that people paid special negative attention to the Maserati because of the type of car that it is. Had it been another model, say an Altis, he believes that netizens’ responses would be different.